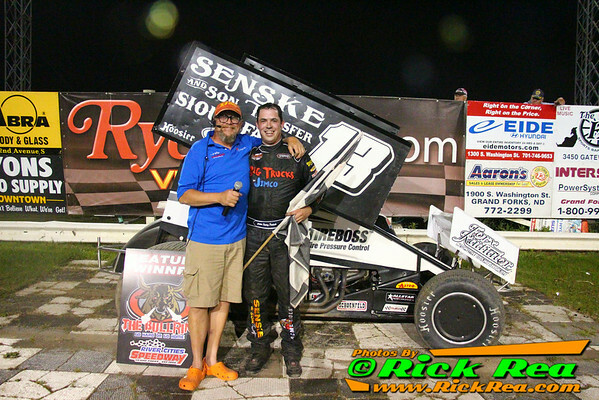 GRAND FORKS, ND (July 25) - After getting involved in incidents not of his own doing the past two weeks, Mark Dobmeier put an end to his steak of bad luck by parking his #13 in RydellCars.com Victory Lane. Thomas Kennedy and Alex Larson led the 25 car field to the green flag, but Dobmeier came flying though the pack and took the lead on lap two. Once things got sorted out, it became a three car race for the point between Dobmeier, Kennedy, and Austin Pierce, who was looking for his fourth consecutive win at RCS. Kennedy and Pierce swapped slide jobs for the second position until Pierce threw his #2A into turn three a little too hard and slid up and over the banking on lap 14. Pierce was sent back to 20th for bringing out the caution, but rebounded for a seventh place finish. The race went back green and Kennedy, who had faster lap times than Dobmeier throughout the race, was back on the chase as he tried to catch the winningest Sprint Car driver in RCS history. Kennedy was right on Dobmeier's heels as they headed into turn one on the 15th circuit when Kennedy hit a rut which upset the car and sent him barrel rolling off the turn two embankment. The upset and dejected Kennedy was OK, but knew his golden opportunity of picking up his first career victory at RCS was over. The race resumed when Kennedy's #20K was removed from the track and Dobmeier picked up right where he left off. He drove a flawless final 10 laps and cruised to his 105th victory at RCS. "On the first start I saw some moisture in turn one and two and everybody was all going around it. I knew that was going to be a great opportunity, then a whole opened up and I went right for it," said Dobmeier following the race. "I was able to slip up to second in that first corner and that's what got me going. Then I just got whipping up around the top and carried my momentum through the race."